Carol (Smokey) Nightingale acquired his first tattoo from his mother at the age of eleven. It is said that his mother, who worked in the circus, taught him the art of tattooing. 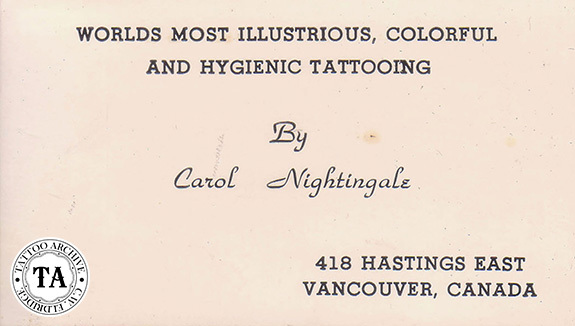 Nightingale spent twelve years in the Merchant Service and started tattooing in 1957. He called tattooing dermographics. It was said that he specialized in designs related to the female form and used an ultrasonic method of cleaning his equipment. Known as "The Man with the Golden Needle," Nightingale was a pipe smoker, hence the nickname Smokey. 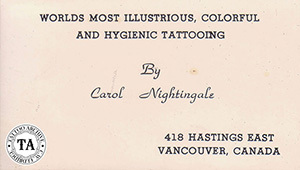 Carol Nightingale, a Canadian, tattooed in Alliston, Ontario and in Vancouver, British Columbia at #418 Hastings Street East. He relocated to the United States in 1965 and set up shop in the nation's capital, Washington, DC at #900 Twelfth Street NW where he built a very unique shop. To enter you would push the buzzer wherein he would come to the door and ask you what you wanted. If you answered incorrectly, he would ask for an admission fee (on my first visit it was $10.00). Once these formalities were over you would go inside. Nightingale tattooed in a metal cage, often with a dog in there with him. His shop was in a rough section of DC, just across the street from the bus station, so his security was above the norm. 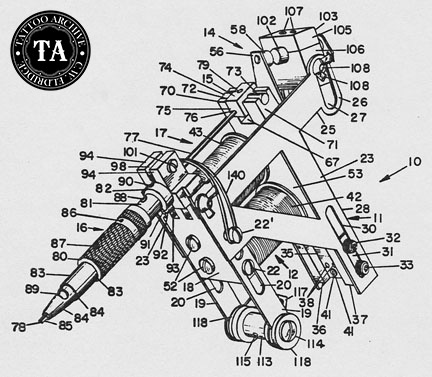 "An electric marking device for tattooing humans, animals, and for other applications comprises a frame assembly having a rectangular prismatic base and a pair of side plates secured to opposite sides of the base, an electromagnet assembly mounted on the base between the side plates, an armature assembly adjustably mounted between the side plates above the electromagnet assembly, an interrupter switch supported between the side plates above the armature assembly, a needle guide assembly holder pivotal supported to the front of the base, a locator key slot provided in the needle guide assembly holder, a tubular needle guide assembly included a central tubular hand piece and upper and lower tubular extensions, a positioning collar secured on the upper extension in predetermined position, a locator key secured to the positioning collar, the needle guide assembly being removable assembled with the needle guide assembly holder in predetermined position by mating the locator key of the positioning collar with the locator key slot of the needle guide assembly holder." This technical-ese is typical of the language used in patent forms, as if applicants are searching for the wordiest descriptions possible. Nightingale's patent was accepted on July 3, 1979 as #4,159,659. To our knowledge, this machine was never mass-produced. 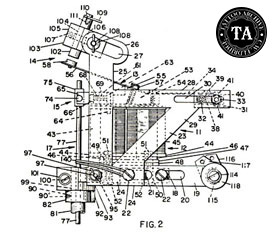 In the 1980s Nightingale formed a supply business named The Hanover Schmaltz Co., probably with the idea of marketing the machine he received the patent for. Information in the Archive's collection of supply houses only offer Nightingale's version of the flip-top tube pre-soldered needles, rather than the completed product. Frank Mills was tattooed by Nightingale in the early 1980s and later bought equipment from him. In a phone conversation Mills said that the flip-top tubes came in two sizes, the standard tube length (4 inches plus or minus) and the giant size (7 to 8 inches). Nightingale's supply flyer stated the length to be 5 1/8 inch (plus or minus). If you have never seen one of these tubes, here is his description: "These hand pieces (Nightingale's term for a tube) have a precision fitted door that will warm the cockles of your heart; a flick of the thumb and the door opens wide, enabling the operator to clean the interior ultrasonically (or otherwise). The same innovative open door permits you to check the position and alignment of needle shaft and needles, removing the blind spot and guesswork. Also, with the door open, it's a simple matter to withdraw and introduce alternate needle bars." There was no mention in this supply flyer of his patented machine or having it for sale. "I am the great, great nephew of Carol "Smokey" Nightingale (Carol Grub). Carol was raised in southern Ontario, Canada, around Kitchener and I last saw him at my grandmother's funeral. My grandmother was his biological sister. Carol was raised in a family very dedicated to its Catholic beliefs; two of his sisters were nuns. Only one of his sisters is still alive today. It is highly unlikely that Carol had his first tattoo given to him by his mother. I am not certain if she could tattoo, although she was adept at needlepoint and made a mean coffeecake. It is definite that she never traveled with a circus. Odds are that she never even saw a circus performance. Please understand, there is no malice intended in this email, but rather I just wanted to let you know 'the real dope'! PS. I am still laughing about my grandmother in the circus!